Even the best human-engineered solar cell is essentially a clunky dial-up modem compared to the sleek high-speed efficiency of the humble leaf. After all, plants have had about a billion years to perfect the process of photosynthesis, which uses energy from the sun to convert carbon dioxide and water into glucose (used by the plant as fuel) and oxygen (used by all of us). "If you shine light on a man-made solar cell, only about 10 percent of that light can be turned into electricity," says Gary Hastings, a biophysicist in Georgia State's Department of Physics & Astronomy. "In plants, nearly all of the light absorbed will be turned into chemical energy. The question is, how do plants get to that level of efficiency?" Hastings grew up surrounded by green in the lush countryside near Edinburgh, Scotland, and today his research is focused primarily on unraveling the minute details of photosynthesis. One factor that makes photosynthesis so efficient is that it occurs at incredibly high speeds. 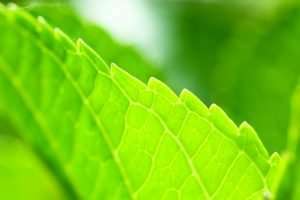 During the process, sunlight hits a light-trapping pigment—chlorophyll—that energizes an electron, causing it to fly across the cell's membrane in mere billionths of a second. The electron makes its journey via a series of specially located pigments, which evolution has finely tuned to create what is essentially a one-way path. Meanwhile, in artificial solar systems, the electron can easily bounce back across the membrane, losing its energy and rendering the whole process much less efficient. Hastings uses infrared spectroscopy, which analyzes how infrared light interacts with matter, to better understand this and other complex reactions that occur during photosynthesis. In late 2017, he received a two-year, $400,000 grant from the U.S. Department of Energy's Office of Basic Energy Sciences supporting his work, which could lead to the development of improved artificial solar cells to help power our cars and heat our homes. In his lab, he's examining how replacing these chlorophyll pigments with other, differently structured pigments will change the rate at which electrons travel across the cell membrane. But rather than green leafy plants, Hastings is studying photosynthesis in cyanobacteria, often called blue-green algae. Cyanobacteria have the same solar energy-converting machinery as plants, and photosynthesis works in exactly the same way—but they're much easier to study. "Purifying the plant material is complicated," says Hastings, "and it's much simpler to genetically engineer cyanobacteria than it is to engineer plant cells." He's also studying how blue-green algae could inform other processes, such as the production of biofuels. When algae cells grow, they produce lipids, which can be extracted from the cells and then turned into diesel fuel. "So, the question is, how can we develop methods that result in over- production of these lipids," he says. Another potential application of his work: forecasting hazardous algal blooms, out-of-control colonies of algae that are becoming more prevalent across the U.S.
"The green slime you see on ponds and waterways is a huge buildup of algae," Hastings says. "They are called hazardous blooms because they can be toxic to animals that drink the algae-laden water, and they can also negatively affect human health. Our goal is to monitor algal blooms using spectroscopy and then build technologies to predict their recurrence."